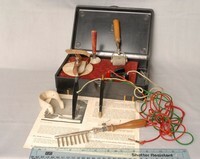 Non-electric razor with cutter driven by friction motor and external hand-crank. Dark maroon phenol plastic body similar to later electric version.Sliding cutting head similar in principle to Schick/Remmington with sliding cover. Stiff metal case covered, normally with cleaning brush supplied. Tricky to use as two simultaneous actions are needed - cranking the lever and guiding the shaving head. Philishave was the brand name for the electric shavers manufactured by the Philips Domestic Appliances and Personal Care unit of Philips (in the U.S.A., the Norelco name is used instead). In recent years, Philips had extended the Philishave brand to include hair clippers, beard trimmers and beard shapers. Philips used the Philishave brand name for their shavers from 1939 to 2006. The Philishave shaver was invented by Philips engineer Alexandre Horowitz, who used rotating cutters instead of the reciprocating cutters that had been used in previous electric shavers. The shaver was introduced in 1939, though initial production was limited due to the outbreak of World War II (the production facility in Eindhoven, the Netherlands was overrun by the German Army in 1940). After the war, a slightly improved version of the cigar-shaped single-head shaver was introduced. A more ergonomic egg-shaped single-head model was introduced in 1948 and was designed by US industrial designer Raymond Loewy. Global sales increased markedly after a double-head model was introduced in 1951. The brand name Philishave was phased out in 2006. 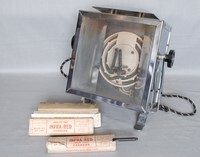 The Pifco Razor Lite, a small mirror with a mains lamp behind, which shines through a small area of the mirror. Electric Hair curling system with heated rods holding curling tongs. This is a very early example of an electric hair dryer. Another example of an early hair dryer. They ARE extremely heavy to use. A hair dryer originating from the 1930's. The name Forfex still exists, and hair dryers and clippers are still made under this brand name. A small battery in the block is connected to wires on the brush used as the bristles. As the hair is combed the current from the battery passes through the scalp via the wires. The instructions claim that the brush can stop baldness and grey hair from forming if the unit is used seven minutes in the morning and five minutes at night, every day. It was not actually very effective. We think that this would be considered a Quackery item. "Electricity gives life giving properties to the hair right down to the roots". According to the instructions, one 3 volt battery can do all this?. Just switch the unit on and brush 5 minutes in the morning and 7 minutes at night. The bristles are sharp hard wire, it must have been very painful to use. We think it's another Quackery item. Rolls Razor Ltd. is probably best known because of its sets of safety razors with a sharpening device (1920's and later) and later its manually driven Viceroy Non-electric Dry Shaver (patent application filed 1937). In the 1940's and 1950's Rolls Razor also manufactured electric shavers. Assuming good prospects on the electric shaver market, Rolls Razor opened a new factory in Hemel Hempstead, where it was one of the pioneers in a new industrial area. However, Rolls Razor announced that it was to close its factory because of mounting losses and fears of a world slump - it was going back 'home' to Cricklewood. The company sold the Hemel Hempstead site and land for expansion to Kodak. Kodacolor film was introduced in 1957 and all the colorfilm processing in the UK was to be carried out at the Hemel Hempstead plant. An ordinary safety razor with modified blade holder which moves from side to side, driven by a small motor in the handle. Batteries are kept in a separate metal box. Philishave was the brand name for the electric shavers manufactured by the Philips Domestic Appliances and Personal Care unit of Philips (in the U.S.A., the Norelco name is used instead). In recent years, Philips extended the Philishave brand to include hair clippers, beard trimmers and beard shapers. Philips used the Philishave brand name for their shavers from 1939 to 2006. The Hair Curling Iron was heated inside an electric element on a stand. For domestic use. Personal massaging equipment for the home. 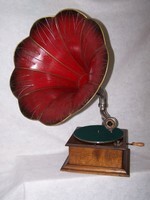 It has rubber pronged disks fitted to the motor and a mechanism to create a vibrating motion. 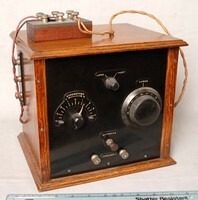 A simple needle and a wrist strap connected to a battery, and power control to increase the voltage. The needle is inserted into the channel of the hair until it reaches the root, the voltage kills the root and the hair will whither and die. Ladies hair removal system. It consists of a simple needle and a wrist strap connected to a battery and power control, which gradually increases the voltage. The needle is inserted into the channel of the hair until it reaches the root, the voltage kills the root and the hair will drop out. Relieves Colds, Sinus, Rheumatic Pains, Muscular Aches and Pains, Stiff Neck, Sore Throat, Pains in the Back! or so the pamphlet says. Just switch on and rub over the affected area. Cost �4.00 in the 1950's. We think this might be considered Quackery.